The U.S. Environmental Protection Agency recently allocated over $3.5 million through the Great Lakes Restoration Initiative (GRLI) to organizations in Indiana and Illinois to protect the waters of Lake Michigan and the surrounding watershed. 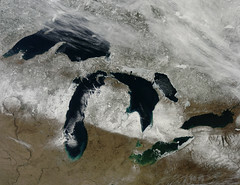 In total, the GRLI will distribute almost $30 million spread across 70 grants throughout the Great Lakes region to promote its five goals of cleaning toxins from the water, combating invasive species, mitigating polluted stormwater runoff, protecting critical habitats, and tracking progress of the initiative. In Illinois, nearly $2.7 million was awarded to seven organizations, with the Chicago Park District receiving $1.1 million to improve and maintain the quality of city beaches. The funds will be used to improve infrastructure and provide daily grooming to 24 area beaches to ensure healthy swimming conditions and prevent closures due to contamination. In Indiana, the recipients of grant money were the Save the Dunes Conservation Fund Inc. and the University of Notre Dame. Save the Dunes plans to use funding to reduce phosphorus and sediment deposits into Lake Michigan, while the University will invest in research aimed at controlling carp and other invasive species. Visit EPA.gov for the full story in Indiana or Illinois.